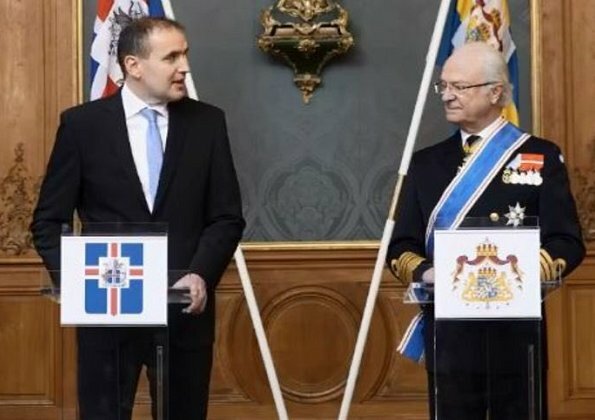 President of Iceland, Guðni Thorlacius Jóhannesson and his wife Eliza Jean Reid currently makes a 3 day state visit to Sweden upon invitation of the King of Sweden. 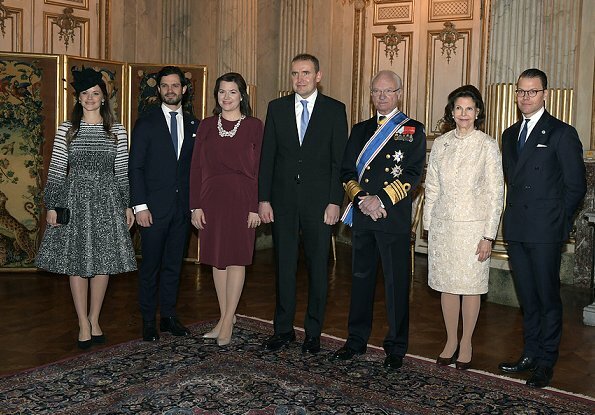 On January 17, 2017, President of Iceland and his wife were welcomed by King Gustaf of Sweden and Queen Silvia of Sweden with a state ceremony. 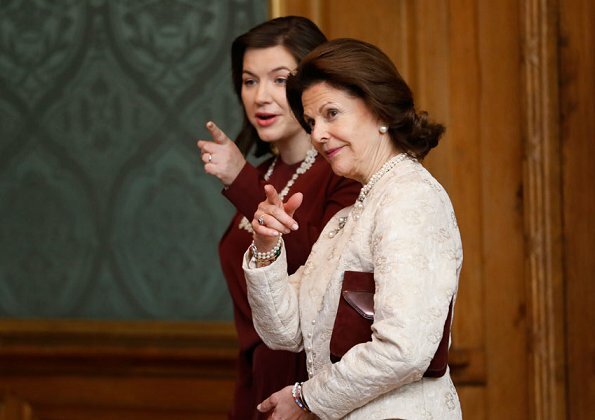 The King and the Queen invited President of Iceland and his wife to the Stockholm Royal Palace for lunch. Prince Carl Philip, Princess Sofia and Prince Daniel attended the lunch. A bit disappointed. Sofia's outfit its hideous I'm sorry. It doesnt look good not even on the model. The queen did made a great choice either. The outfit doesnt seem to fit her figure. The lady from Island look great though. Lovely color. The best dressed to me. Agree to everything you say! Unfortunately Princess Sofia hasn't got any sense of suitable fashion. It's funny, you always pop up on posts like this saying Sofia has no sense of style. I'll agree the dress she's wearing isn't the best but why don't you ever comment on posts when she looks beautiful? You're just one of many on here who like to bash her regardless of how she looks. No this dress she´s wearing isn´t the best choice. But she always prefer to wear dresses by Swedish designers. Great! @Liza .... I've written three comments about Sofia, two critical, one compliment. Anyway -usually I don't like Sofia's or Madeleine's style. In contrast, Victoria's style rarely disappoints. Silvia looks good but this is a big miss to Sofia. Series clothes what make slender Sofia look enormous. Better luck next time. I rather like Sofia's dress. I think it's the silly, and inappropriate, hat that ruins the look. If she had just worn her hair in a soft up-do then it would have made a lot of difference. Silvia hasn't worn a well-fitting suit in ages. She makes herself look unnecessarily matronly. OMG,this dress is simply awful and destroy silhouette of Sofia.Terribel choice. I think Sofia is a really beautiful woman and that the comments about her are often too mean-spirited. But, there is no defending this ensemble. It's ugly and costume-y in addition to being wholly unflattering. I totally agree with you, Darla! My 2 cents? Sofia's dress is kind of ugly, and she does not seem to have a sense of what suits her and what doesn't. I like Sofia's dress, but both this photo (I've seen others) of Sofia and of the model are not the best to show the dress! But why on Earth is she, as the only one, wearing a hat indoors ???? Sofia's dress is the kind that only looks good on the model, but not on anybody else . Not a good choice, the Queen's outfit is the kind that has been around for the matronly royals for 40 years. I didn't even recognize Sofia 😲 Strange look! I like Princess Sofia, but she should not wear a full skirt type of dress. Her figure looks funny in this dress. She actually has a excellent figure, but this type of dress is not for her. The colour is okay. Sophia is way too short to wear horizontal stripes and a full skirt. Ridiculous look. Her hat is not a hat to go with Shirley Temple cork screws. She looks best in slimming dresses that follow her petite figure.